This year, I started my Christmas shopping in September. Sad, I know, but I always end up running out of money before the big day and giving my credit card a battering! If you’re looking to start early and are buying gifts for food lovers, here are some gift ideas from Bristol-based retailers. We’ll keep adding to this in the run up to Christmas, so if you’ve seen something amazing that we’re missing, let us know! 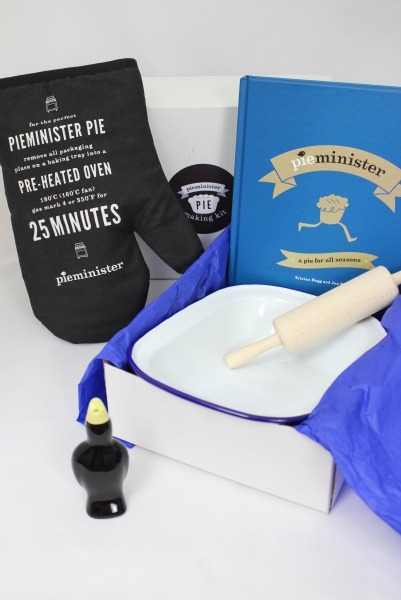 We’re loving this Pie Kit from Bristol-based pieminister! 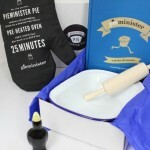 Priced at £30, the kit includes a signed copy of their book “A Pie For All Seasons”, a pieminister oven glove, a blackbird pie funnel, a rolling pin and a smart enamel pie dish. Buy online from the pieminister website. 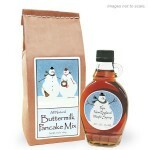 Mill Valley Market (previously known as American Kitchen) now have a permanent stall in St Nicholas Market, offering a great range of American and British speciality foods. I love the look of their s’mores kit, which includes 4 roasting sticks, 1 bag of chocolate, 1 bag of marshmallows, 1 package of graham crackers, campfire songs and the history of s’mores. They also have a great festive combo of a buttermilk pancake mix and snowman maple syrup! There’s a whole host of cookery books by local authors out there! We’ve already mentioned the pieminister “A Pie For All Seasons” book (£12.59 on Amazon), but there are plenty more! Genevieve Taylor has just published “Marshmallow Magic” (£7.59 on Amazon), or try “The Contented Cook: Fuss-free Food Throughout the Year” (£13.99 on Amazon), published by Xanthe Clay this year. Bristol offers a massive variety of places to buy Christmas hampers! Try Arch House Deli in Clifton Village, at prices ranging from £15 to £250. Papadeli‘s hampers range from £50 to £150, and The Bristol Guild on Park Street also offers a great DIY hamper service. Bristol’s great for booze! Bath Ales offer a range of gift packs, as well as their standard beers and accessories. The Bristol Cider Shop is a great shout for cider lovers, with gift boxes in a range of sizes and a gift voucher service. Bristol Beer Factory are once again launching their 12 Stouts Of Christmas at the start of November, and those buying for wine lovers should definitely check out Grape & Grind on Gloucester Road. Tea lovers may well appreciate a gift from Bristol’s very own Lahloo Tea – take a look at their website for a range of gift ideas including some great tea taster sets. ATTIC (All The Teas In China) also have some great gifts on their site, including this five tea taster pack for £30. For those whose hot drinks tastes err more on the side of coffee, try Extract Coffee for a monthly coffee subscription, or St Michael’s Hill’s Two Day Coffee to create a unique coffee blend for a special someone. Maison Loulou Chocolates, based in Cheddar, have some great festive options in their online shop, in addition to their standard chocolate boxes. Chocolate lovers should also check out local Zara’s Chocolates for their new Christmas range. Edibubble Gifts have a range of “sweet trees” and other gift ideas, and chocolate shoes and handbags from Choco Rico are a great ladies’ gift! Or, if your gift recipient’s tastes fall more along the retro sweets line, head to Fizzy Lips in Broadmead or Treasure Island Sweets in St Nicholas Market for some ideas.